ER™ Shelter-in-Place Sheeting is designed to be used in the process of sealing up a room as a temporary protective measure to create a barrier between you and potentially contaminated air outside. includes procedures, diagram, and instructions. Plastic sheeting and duct tape are used to cover all openings in the room including all windows, air vents, and electrical outlets. It has been recommended by the Department of Homeland Security for fire, chemical, biological, and radiological disasters. Why do you need to Shelter-in-Place? It is possible that chemical, biological, or radiological contaminants may be released accidentally or intentionally into the environment. Should this occur, immediately follow the instructions included provided by local authorities. 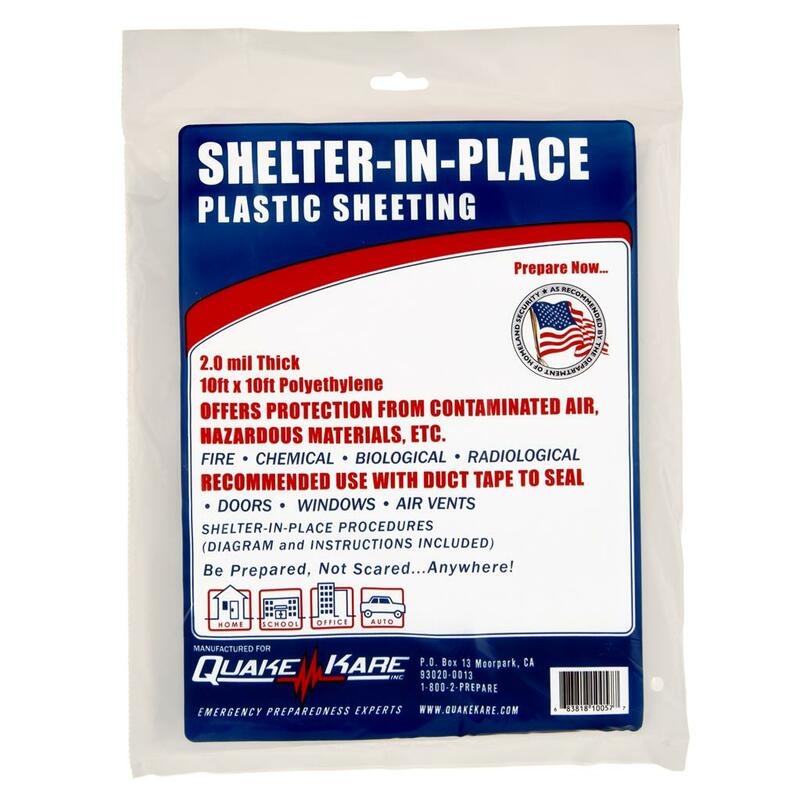 Plastic sheeting offers protection from contaminated air, hazardous materials, bad weather, fire, and biological, chemical, and radiological terrorist attacks. Recommended to use with duct tape to seal doors, windows, and air vents. single (1): 1 9.5 x .25 x 12.75"
case (72): 19 x 11 x 102"
pallet (3,600): 48 x 40 x 72"
Instructions: Pre-cut the plastic film to fit over all openings in the room. 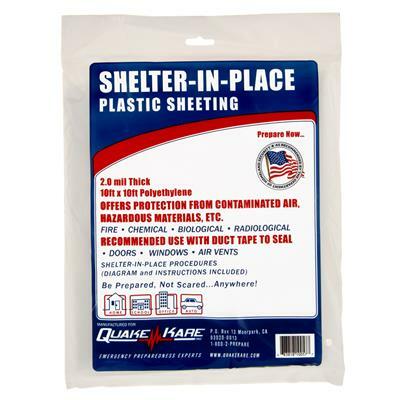 Cut the plastic sheeting several inches wider than the openings and label each sheet. Use duct tape to secure the plastic sheets to the walls, starting with the corners first, then tape down all edges Use duct tape to seal between the door and door frame. Lay a slightly wet towel, sheet or article of clothing along the bottom of the door. Provides shelter and protection from contaminated air and hazardous materials, resulting from a terrorist attack or other disaster. Recommended for use with duct tape to seal doors, windows and air vents. Can be used to construct a temporary shelter and to provide protection against the elements when sheltering-in-place outside.